Are employee attitudes correlated with financial success? Unequivocally yes! according to consultant and bestselling author David H. Maister. Based on a worldwide survey of 139 offices in 29 professional service firms in numerous lines of business, Maister proves that companies perceived by their employees to practice what they preach in matters of client commitment, teamwork, high standards, and employee development are more successful than their competitors. Put simply, employee dedication causes improved financial performance. Through in-depth interviews, Maister explores the crucial role of the individual manager in promoting high morale among employees. 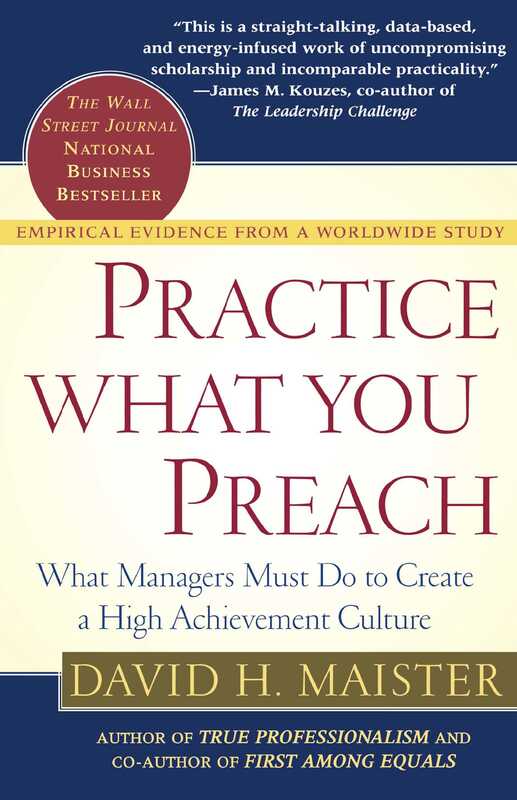 Practice What You Preach boasts specific action recommendations from the managers of these "superstar" businesses on how to build an energized workplace, enforce standards of excellence, develop people, and have fun -- all in the name of profit. As a result, Practice What You Preach can help any manager increase profitability, and provides proof that great financial rewards come from living up to the standards that most businesses advocate, but few achieve. David H. Maister, one of the world's leading authorities on the management of professional service firms, is the author of several successful books, including Managing the Professional Service Firm, True Professionalism, and Practice What You Preach, and coauthor of The Trusted Advisor. James M. Kouzes Co-author of The Leadership Challenge This is a straight-talking, data-based, and energy-infused work of uncompromising scholarship and incomparable practicality. Lawrence A. Weinbach Chairman and CEO, Unisys Corporation A great "how to succeed" manual for organizations in any field. Maister confirms that success is not about programs and policies but is about the honesty, integrity, and courage of the leader. Michael Albrecht, Jr. Global Executive, IBM David Maister has, with compelling evidence, blown away the mysteries as to what makes a high-performance team. He offers great insights and definitive actions. Robert R. Garland National Managing Partner of Assurance and Advisory Services, Deloitte & Touche David Maister has done it again! He has written yet another insight-filled book that will facilitate your growth as a business leader and manager.